B-2-51 Compound area facing Pacific Ocean -lagoon in foreground. Golden Gate Bridge from our IFC area. 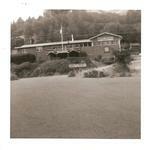 Muir Woods Inn. Photo by Paul Petosky July 7, 1963. IFC (inside IFC area) That is James Mamph on guard duty. From our B-2-51 barracks - missiles up at our launch area. B-2-51 (Bumble Bee helicopter outside our IFC area).